Shop Peak SAE 5W-30 Motor Oil (32 oz. )32 oz. Shop Peak 10W-30 Synthetic Motor Oil (32 oz. )32 oz. 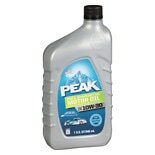 Shop Peak 10W-30 Motor Oil (32 oz. )32 oz. 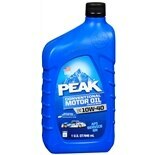 Shop Peak 10W-40 Motor Oil (32 oz. )32 oz. Motor oil is one of the most important components impacting the overall life of your car because it performs several essential tasks. In order to maintain the health of your engine, however, it's important to change your oil according to the routine timetable laid out by your car's manufacturer. Here at Walgreens, we have a wide selection of motor oil so that you can easily find the best variety for your particular automobile. The internal combustion engines that power cars, motorcycles, trucks, and even smaller appliances like lawnmowers and portable generators function via several different parts moving together in unison. In order for these engines to function as efficiently as possible, it's essential to reduce friction so that they don't wear out as easily. Motor oil is a refined lubricant that cycles through the engine and coats metal parts to increase efficiency and reduce wear. The oil also helps cool the engine and picks up debris to keep the engine clean. Different types of motor oils might be petroleum-based, bio-based, or synthetic, and these products are given grades by the Society of Automotive Engineers based on their viscosity. Regular oil changes are among the most critical maintenance tasks you'll need to perform in order to keep your car running smoothly. The older oil gets, the more debris it will pick up, which could eventually damage your engine. Expert opinions vary wildly when it comes to determining how often you should either change your car's oil yourself or have a professional do it for you. Most automobile manufacturers recommend getting an oil change every six months or after driving 5,000 miles (whichever comes first), though certain technicians will recommend changing your oil more often. The task is actually relatively simple to do on your own if you consult your car's manual and find out how to drain the old oil before replacing it. Changing the oil filter regularly is also essential because it helps trap contaminants and extends the life of the oil itself.